Yulia mentioned Ironforge’s King was getting a visit from the Horde, so we bounced over there to do a little defendin’ and help her out. Rolled right in, and the Horde got rolled right out! Camped them until they spirit rezzed, or hearthed out! There were several other Alliance defenders as well, so we certainly had the advantage! About the time we started getting bored, Stormwind started pinging, and then we REALLY got some help! We formed up, and rolled right into the Trade District where Reckoning Day was recking people’s day. Yes I feel clever. We bounced them out at first, then they gathered up below and headed out of the city down the road. Just before Goldshire, we interrupted their attempt to summon more people! Took them totally by surprise from the looks of it, and we chased them off to the four corners of Elwynn! We finally backed up and let them regroup. Gave ’em about 10 or 15 minutes before breaking off to do our own thing at precisely 11:00pm (server time). THAT was fun! LOL! Congratulations! Your name is in many posts! I hope you and Aloraluna are doing a better job of watching Stormwind than the last time I left for a few days. I know I can’t count on Cayreth, he’s a Gnome now. My name is in this post! Also, I found your blog! Mwhahaha! I just read the Kiith version of the event. By that account, they placed their own numbers at 25, and ours at 35, which seems pretty accurate, although I only had six incomplete groups in my Vuh’do. I’m sure there were ungrouped PuGs running around. I’m still trying to figure out how 35 = 50, since we doubled their numbers according to the report, but maybe they’re giving each counted ally a 45% defense bonus for home field advantage? Anyways, we both agree it was some heroic fighting, and hopefully they’ll be willing to face those odds again in the future sometime. Well, after you headed off and folks were breaking up to do their own thing, I overheard someone in Goldshire mention “a horde” who was killing everyone. Since World Defense wasn’t going off, I thought it was strange, but decided to go investigate. Ickyslump opted to tail me (bless her heart!) knowing that if there was trouble there, she’d get her level 72 self smoked pretty fast, but she trotted along bravely beside me anyways. We pull up about even to the Tower of Azora, when my Vanas FILLS with Red Names. 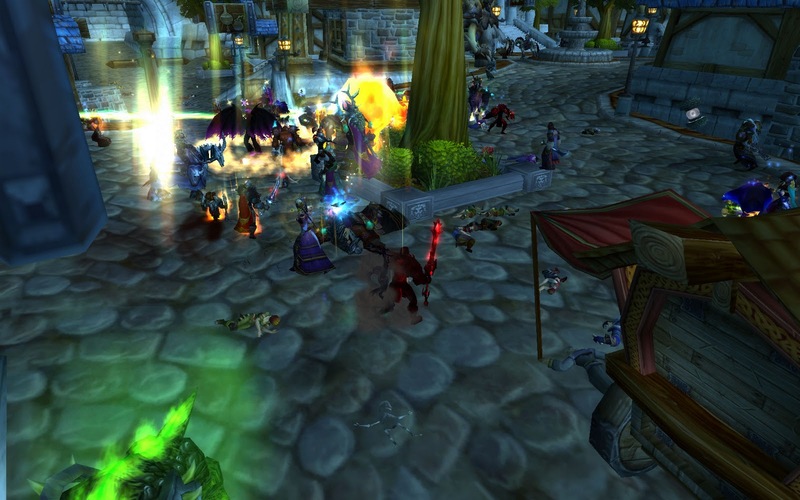 Reckoning Day had regrouped with Kiith’Sa and summoned more people in! Our nose count had estimated about 15 or so. I’m not quite sure how they got ahold of Kyp just outside of Goldshire, but Icky, Kyp and I ate dirt after we tried to save him. Ick and I waited out our flags since we would have to try to get through the gates where the Horde raid was set up. Meanwhile, Kyp had picked up the reins of the defense raid, and was re-forming. 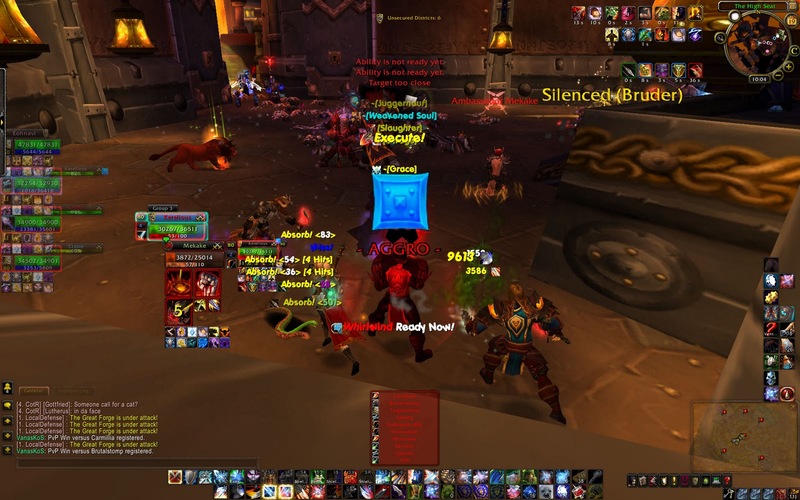 We got a bulk of people into Vent, and I relayed his orders in raid warnings. By the time we had gathered everyone in, we had about 30 people in the raid (of varying levels and PvP gear), and the Horde raid was reported to be about 20. Not terrible odds when attacking a major city, but certainly much more than the Horde are ever used to dealing with. We set up at the mouth of the tunnel leading into the Trade district from the Valley of Heroes. The Horde raid finally moved in, and cautiously put some of their healers in reserve near the back. Let me tell you, Kere, people were being SO good about waiting and holding their positions and focusing on called targets, as well as guarding our healers. Being one of their favorite people, they tunneled the ever-lovin’ CRAP out of me, but the other healers backed me up something fierce! I was so proud of everyone! Oh, we had a few chuckleheads who kept running out into the middle of their raid, attacking them, and getting smoked, but PuGs are PuGs. Anyways, long story short (too late! ), the second round was much the same as the first. Only having seen what they were up against, they were more cautious and deliberate. They kept trying to lure us out to a kill zone of their devising (they wall-jumped their ranged attackers onto the gates, out of our reach, and had rogues positioned all along the bridge), but our raid was patient and disciplined and refused the bait, forcing them to come to us again. All in all it was a lot of fun. For us, anyways. I haven’t seen much response on the main boards to my “Thanks for coming!” post, so I’m fearing they’re kinda sour on the whole thing, even though they should have been some pretty fun fights for them. Yeah but I missed 2 of the 3 pushes on round 2, so I’ll let someone else give the lowdown if they want. And then MOAR PvP happened! Next story ALL HORDE ARE BADS! Previous story Just because we lost, doesn’t mean we can’t have the keep!